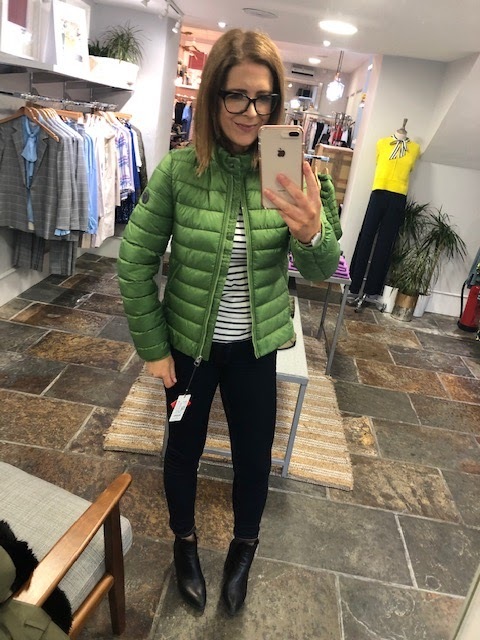 [AD - travel costs covered] I headed up to local boutique Jude Law in Magherafelt this week to check out the new collections that have started coming in for SS19 and to check out the sale as it moves to the magic 70% off. 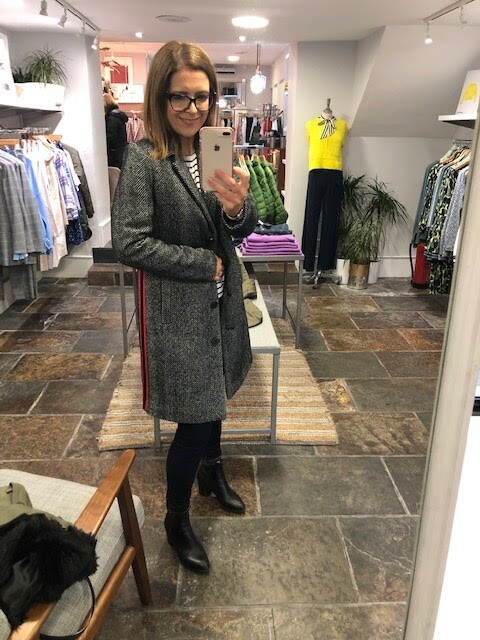 Magherafelt is a great shopping town and Jude is an amazing buyer so I love to get down once every couple of months to check out what she's brought in for the new season. I can highly recommend her Facebook and Instagram videos where she showcases each delivery. 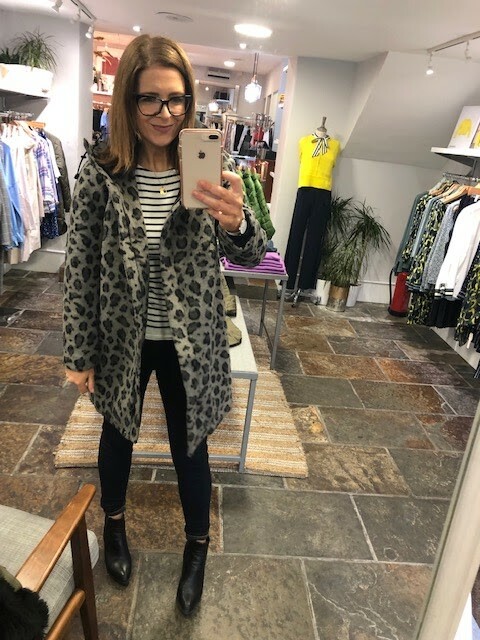 As soon as I set foot in the shop, I started trying on sale and non sale items.....I was like a child in a sweet shop! I'm going to show you the new season first and if you keep scrolling down, you'll see the sale stock. 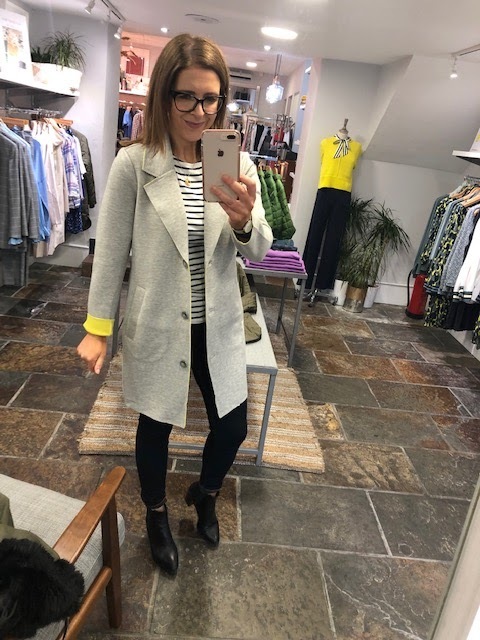 New season begins with this lightweight jersey coat from Sandwich which comes in a warm light grey marl with a stunning yellow lining that you can show off by rolling up the sleeves. But if you prefer to keep it as a discreet pop of colour, you can leave the sleeves down. 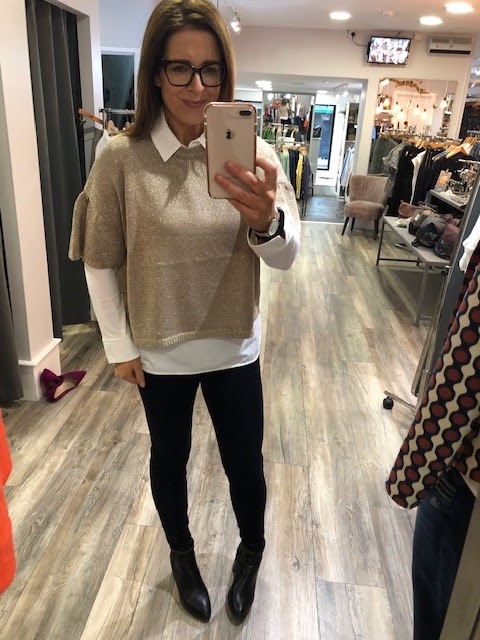 It's my favourite piece from the new collection - casual and soft enough to wear like a coatigan yet with a bit of structure which will allow you to dress it up too. 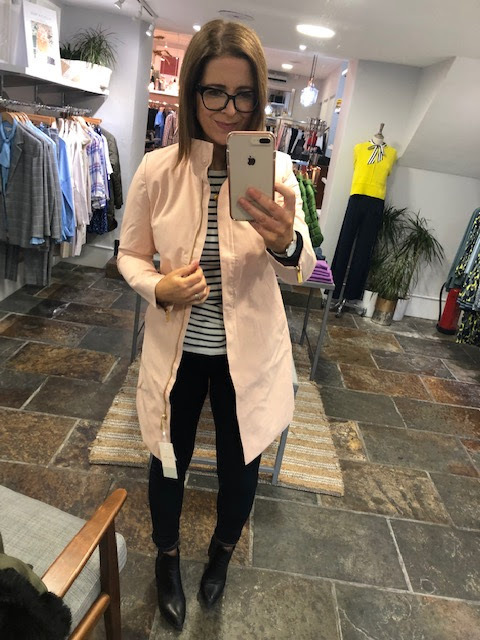 Next, it's a lightweight raincoat from Part Two in a lovely blush/salmon shade - it comes in cream also. 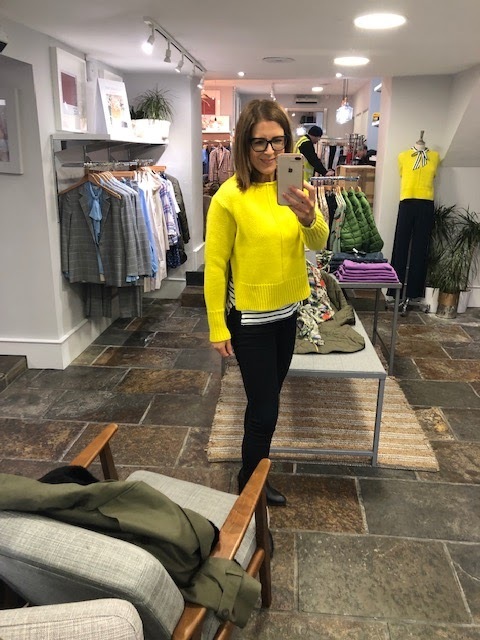 Back to the yellow and I had to try on this jumper - it's got slits up the side so it's very flattering to wear and perfect for layering. I love how Jude has layered it with the black striped top as per the mannequin behind me. 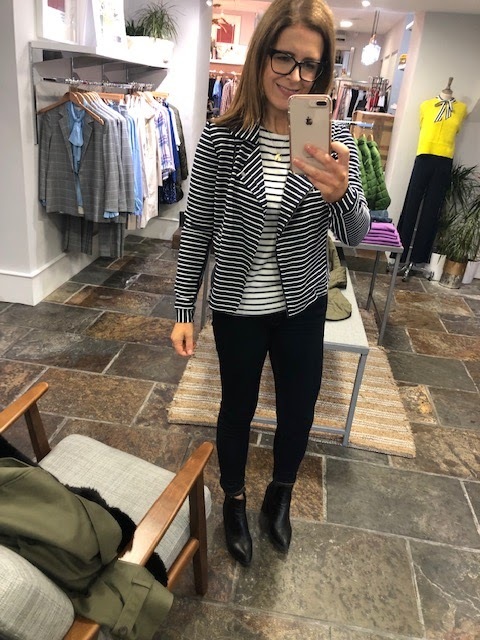 More stripes and again from Sandwich, this is a jersey style biker jacket in a breton stripe fabric. Works well with an opposite stripe as I'm wearing it, or to wear with a bright colour. 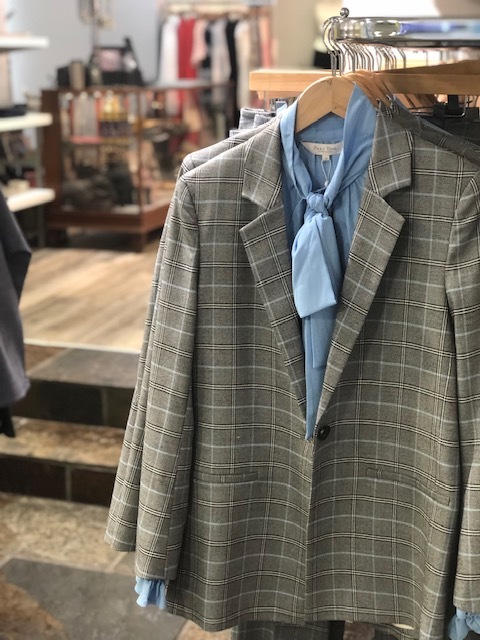 Still plenty of warmer pieces in the SS19 arrivals including this coat from Marc O'Polo. It's made with a new thermal filling called Sorona. An ethical alternative to down and feather fillings and just as lightweight and cosy. There are tons of pastels in the new ranges coming in. 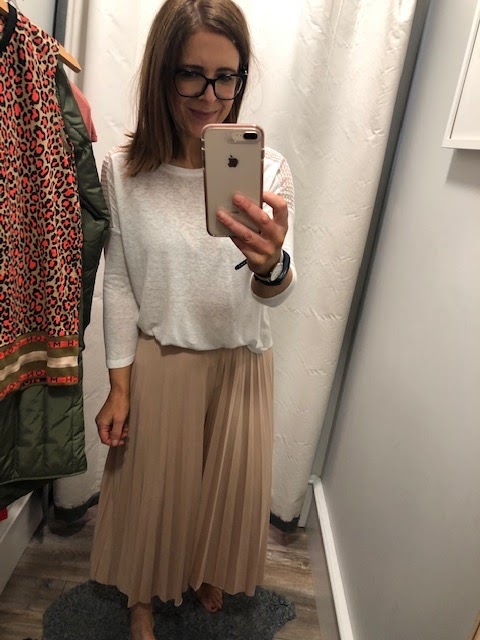 I was particularly taken by these blush culottes that look like a midi skirt. It's a great way to incorporate these colours into your wardrobe if, like me, you can't wear this blush colour close to your face. So comfy and will go with stripes or a slogan t-shirt. Add a biker jacket or a denim jacket and some trainers for a perfect dressed down outfit this spring. 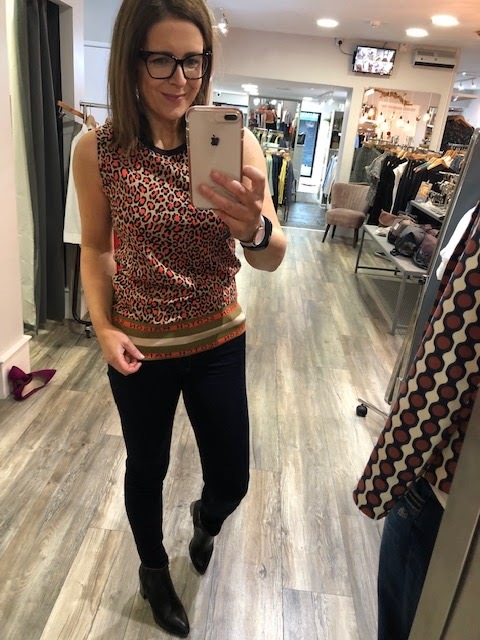 Back into the skinnies and this is a sleeveless leopard top from Maison Scotch. 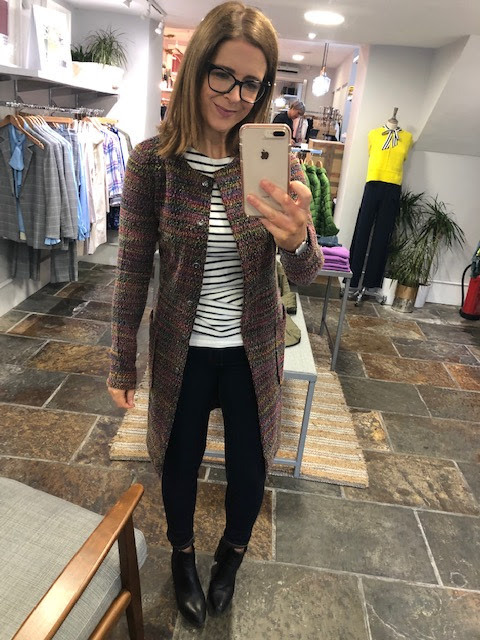 The colours are great and I love the contrast stripe around the base - clashing prints are still very much a thing and this is the perfect nod to this trend. 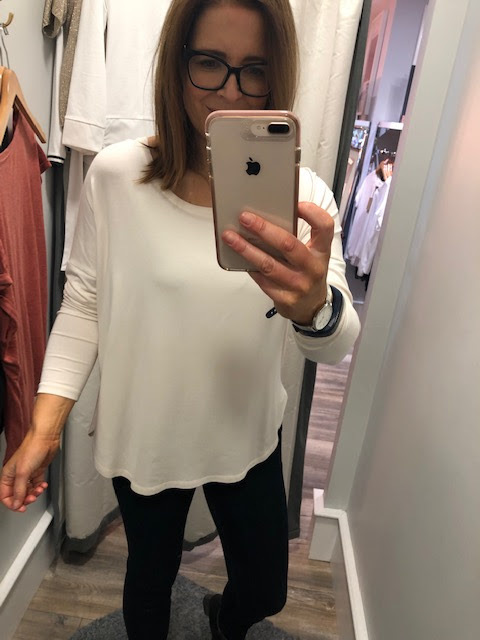 This next top won me over massively - so much so, I ended up buying it! It's got jersey sleeves and a more blouse like material in the body but it was the sports luxe stripe detail that I loved. It will work so well casually and at work. It's by a German brand called Monari. Another great basic top - Jude is so good at stocking tops like this that will work really hard for you. This one is by Great Plains and is a good option if like me, you benefit from a bit of nipping in at the waist. And this coat is cool - it's like a traditional bomber jacket but with a longer line. Effortless style at the school gate or pitch side....in my favourite khaki green. And cosy to boot. And this top is back in - it was a MASSIVE hit last season. It the ultimate layering top with jersey arms and body but with shirt material on the collar, hem and cuffs. Making it ideal for layering under closer fitting jumpers. No annoying buttons or seams showing through - it gives you a gorgeous clean line. 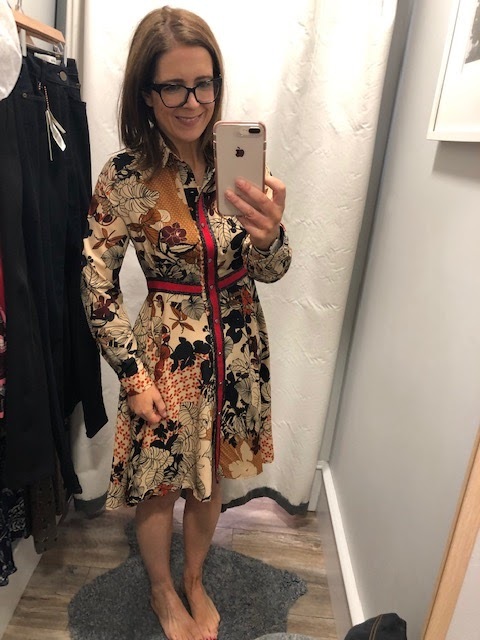 It's £49 and I'm wearing the size 2 which feels like a 10-12. 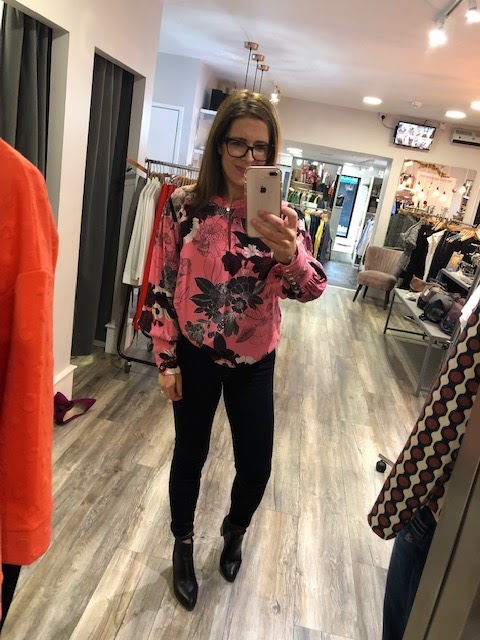 And that's the new season try on....time to move onto the sale which I can exclusively announce will move to 70% off as of Thursday morning, 24th January. In everything I tried on, there are limited sizes left and they will fly out once this extra discount hits. Jude will have to give priority to face to face customers on the day so if you're local, I'd advise trying to get up to the shop but do drop her a Facebook message or give the shop a call if there's something you're desperate to get your hands on and she and Glenda will do their best. Or do what I'm doing and ask a local friend to pick an item up for you!! Yes...even though I tried on half the shop and bought a few bits, there is always that item that gets away. But my friend Anne is on the case first thing Thursday!! Starting with Marc O'Polo, which is a great brand. Lovely quality and always so timeless. 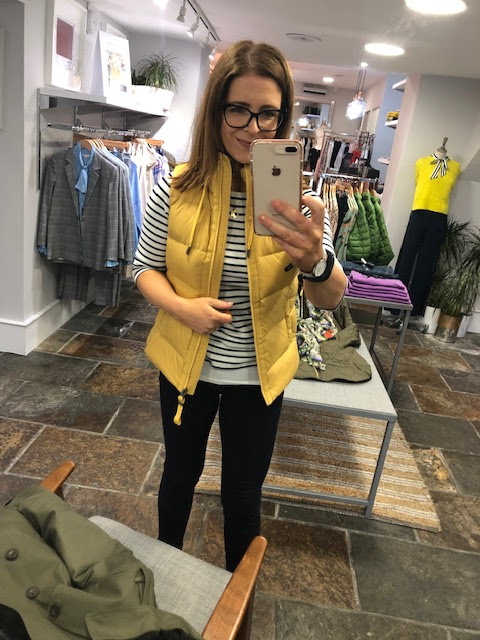 This is an ochre coloured gilet that will see you well through spring, summer and beyond. Down to £61.50. 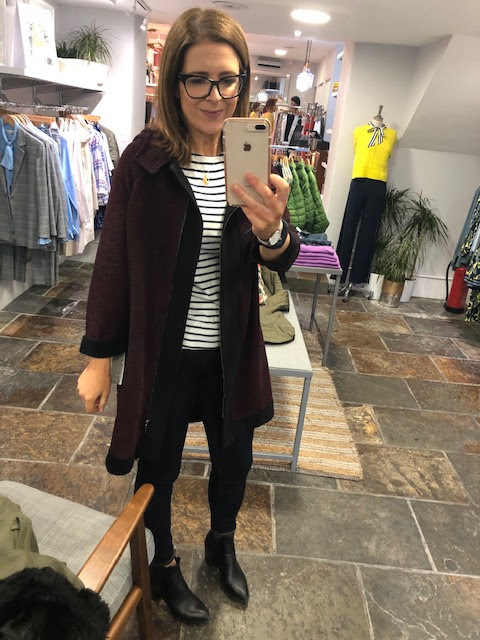 Next up, another great piece for spring summer, a lightweight oversized coatigan from Naya in burgundy with black trim. So versatile and with gorgeous detail. With 70% off, it works out at about £55. 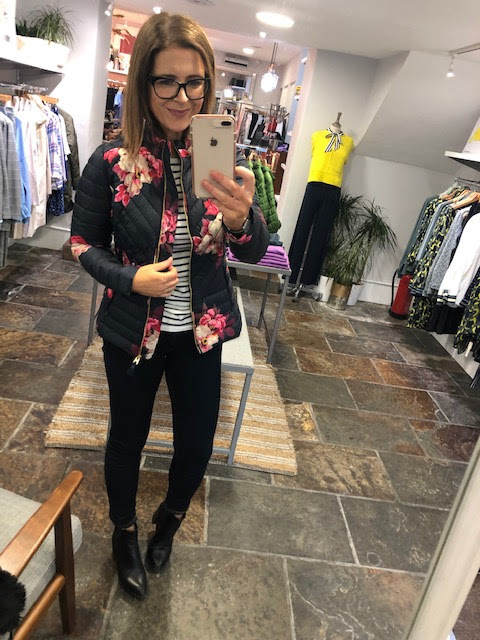 Next one is for the Joules fans out there - a gorgeous floral short padded coat. Again a great one for spring summer. Next up, this coat has been crying out for me to buy it all season. It's from Sandwich, it's padded so it's super warm and the red pop of colour elevates it to something really special. Just over £70 in the sale. There were 2 left when I was in - a size 40 and a size 34. I'm wearing the 40 here and it's a bit too big for me unfortunately. I'd say it feels more like a 14. This next jacket is another lightweight one - along the lines of a coatigan too, with a bit of stretch. Love the colours here - it could be worn with so many combinations. It's by a Dutch brand called Kyraenko and is down to £50 in the sale. 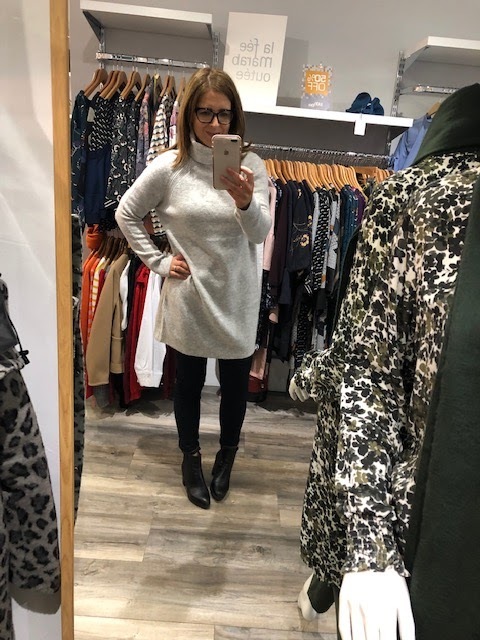 This is not the best photo of this jumper - it's a bit big on me but oh my, so cosy and perfect for wearing over jeans or tights. It's a Great Plains one again and is down to about £26 in the sale. There were 3 or 4 of these left. This jumper was also frustratingly too big for me - I would have snapped it up otherwise. Just one left. Love the colour combination. 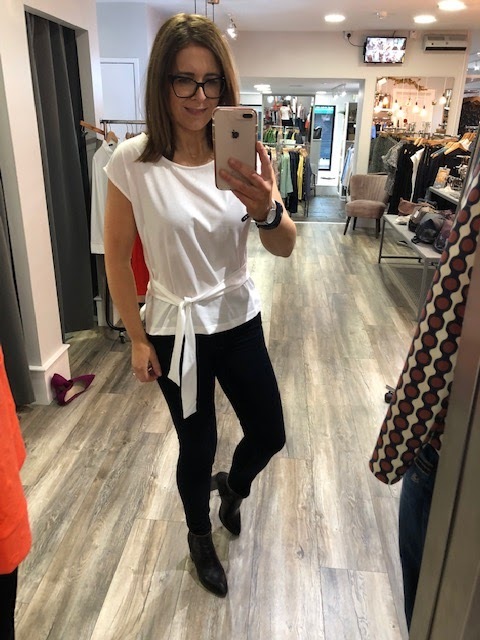 Wearing the most perfect skinny jeans next from MosMosh - Jude has some fab denim in the sale from a couple of great brands. All in or around the £30-50 mark in the sale. This red jumper is a favourite too. Comes in a burgundy colour way also. It's down to £30. This dress is another great mix of trends - the clashing print with a sports luxe stripe. A couple of these were left when I was in. 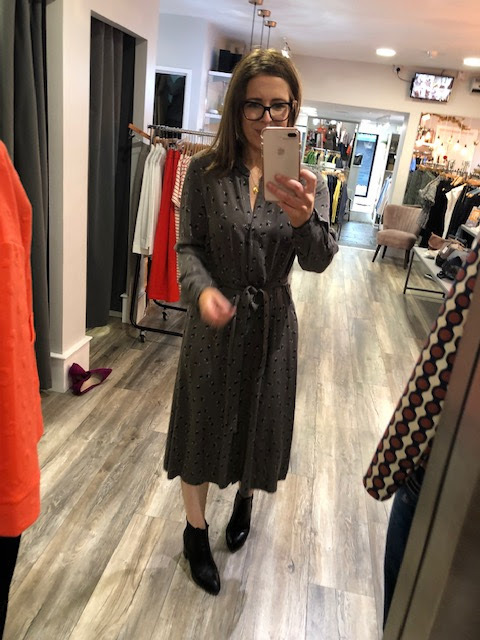 I'm wearing the M/L and it is £27. A longer length dress next - in a great colour and with pockets! Perfect for now with tights and a roll neck jumper underneath. Add a denim jacket and some white trainers and it will take you happily into summer. It's by Sandwich and is £30. Brighter in colour than my photo. I always say that sale time is when you should pick up your jersey basics and this is another one of my purchases. It's from Part Two - a lovely warm cream colour that will work with so many outfits and coats/jackets. Case in point for my final photo as I wear the basic jersey top under this grey bomber style jacket. 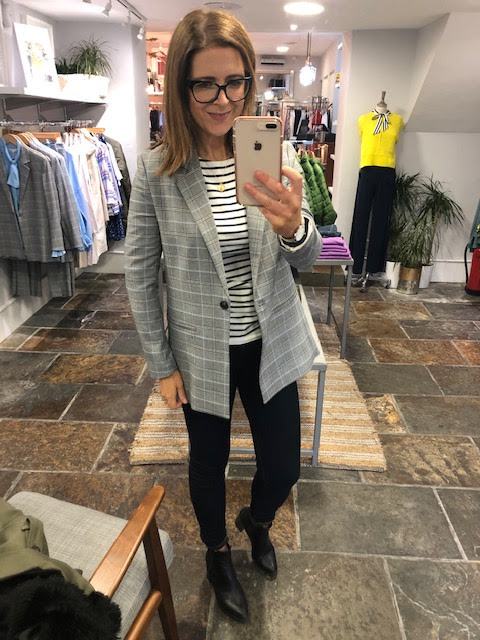 A fab jacket because it's formal enough for work but also so wearable casually. I love it because the elastic isn't all the way around the hemline - a blessing for the pear shapes like me. Just the one left in this colour way and one in the black. Down to £40. And there you go...I've run out of steam! If you want to see videos of all the items, they're over to my Instagram account today. It does help to give you a better feel for the fit and flow of the pieces. If there's anything you want to buy, you can give Jude a follow on Instagram on this link or on Facebook on this link. Or click through to her website on this link, where you can get an email address & phone number. But mostly I recommend heading to Magherafelt early doors, shopping to your heart's delight and then going to Mauds for soup and a sandwich. It took me 40 minutes driving from Belfast and a little longer coming home as there are roadworks between there and Toome. All worth it for a day well spent shopping local...thanks Jude! Disclaimer - not a paid post. Jude covered my petrol/mileage costs to come up this week to cover the sale on Instagram but a blog post was not part of the arrangement. I just wanted to showcase this lovely local shop on here too so that those of you who don't have Instagram still get to see the bargains! Hi Avril, what brand are the blush culottes please? Thanks.